Ultrasound has been used by sonographers and radiologists (physicians who specialize in ultrasound) to image the human body for over 50 years, becoming one of the most widely used tools in modern medicine. Since there is no radiation involved, ultrasound is a safe test to examine pregnant women, evaluate the baby´s growth and determine due dates. • Abdominal Ultrasounds : (including gallbladder, liver and spleen) Patients should not drink or eat anything after 10 p.m. the night before the test. • Breast Ultrasounds: Patients should bring prior mammogram films or reports for comparison, if any. • Pelvic Ultrasounds: Patients should drink 48oz. (6 cups) of water at least one hour prior to the test. • Renal Ultrasounds: Patients should not drink or eat anything at least 6 hours before the test. An Ultrasound is a safe and painless procedure that uses a transducer to transmit sound waves to create an image of the area being examined. During the procedure the radiologist or sonographer will apply a water-based gel on the area of interest and scan such area until a desired image is captured. Most ultrasound examinations are completed in 30 minutes, but some could take up to an hour. All of our diagnostic examinations are interpreted by Board-Certified Radiologists. 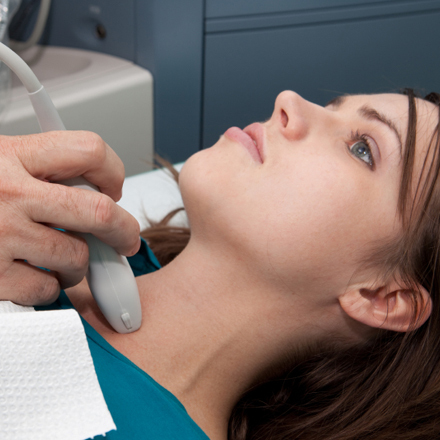 The results of your Ultrasound examination will be sent to your referring physician as soon as they are interpreted. It is the patients´ responsibility to contact their referring physician to discuss the results of their examination and ask for further recommendations.